Remember how I made that offer? After a week of offers and counter offers, and a day of more drama and phone calls and negotiations, I have decided to pull out of the deal. It's a great place, but my instincts are telling me that something...just isn't right, and I do not want to make the biggest purchase of my life just because I can, only to regret it later. Am I disappointed? Sure. Am I giving up the search? Of course not. I am sure I will find the right place for me - a place in which I can put up pictures of my nieces and my Buffy musical poster, paint the walls cobalt blue or sage if I feel so inclined, cook and bake to my heart's content, and knit up a storm. Today I will be crossing everything that can be crossed (fingers, eyes, legs, you name it) not only for USC and the Dodgers but also for myself. Why? I made an offer on a home yesterday! I haven't talked about my real estate search much here because I didn't want to put too much info out for public consumption, but I'd like to make one request at this time: I am asking for your good thoughts. Pretty please? Thank you! Have some free time this afternoon? 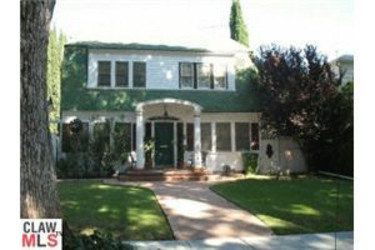 Then you should go check out the open house for the home made famous in Nightmare on Elm Street! Kudos in advance to anyone who wears a red and green striped sweater to this opening. I've been house-sitting in Santa Monica for the past few days. When I took my friend's dog for a walk yesterday morning, I happened upon a house for sale. An elderly woman was sweeping the front yard, and we got to talking. The woman was such fun to talk to - she was very witty and kind, plus she loved my friend's dog, which is always a bonus. I asked if this was her home that was for sale and she said no, that she lives next door. The home is vacant: she just likes to keep it tidy. The woman and her husband bought the home 51 years ago. The home cost $15,000. FIFTEEN. THOUSAND. DOLLARS. Their mortgage was $77 a month. A. MONTH. The home was paid off 35 years ago. I asked the woman if she knew the asking price of the home for sale. She didn't know off the top of her head but figured it was "over one million dollars." Later on when I took the dog for his evening walk, I came across a fact sheet for the home for sale. The sad thing is, someone somewhere will pay that much for the house, if not more. After talking about it for a very long time, I have started looking into buying some property. So far the search has been very...educational. I'm learning about how some realtors who post on Craigslist can be filthy liars (inner monologue while walking through a property yesterday: "This is SO not what the photos said it would be!") and things of that nature. I'll try to keep you posted on my search. Wish me luck! And if anyone has any good advice (like new homebuyer Ariel) for me, I'd appreciate it. Thanks!